The Ireland manager believes there are ‘exciting times’ ahead. O'Neill speaking at today's press conference. 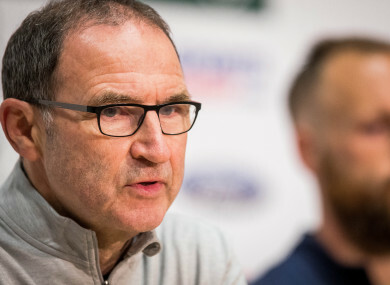 IRELAND BOSS MARTIN O’Neill has dropped his biggest hint yet that he plans to remain in the job after the current qualification campaign — regardless of the outcome. The Boys in Green need to win their final two qualifiers, at home to Moldova tomorrow night and in Cardiff against Wales on Monday, to have any chance of securing a play-off spot for next year’s World Cup finals. Having officially renewed their deals last September, O’Neill and his management team, who took over in November 2013, are contracted with the FAI to the end of this two-year cycle. And speaking at this afternoon’s pre-match press conference, the 65-year-old has revealed that he would like to extend his stay after holding discussions with the association’s chief executive John Delaney. Dublin is one of 13 cities chosen to host a revamped Euro 2020 in three years’ time, and the Derry man suggested that he intends to be in charge for that competition. I don’t think today is the day to discuss it but I must admit that with some of the Euros games in Dublin, there are exciting times ahead,” he added. “Well we qualified for a competition — one out of one. I think the season tickets have gone from 4,000 when we started to 16,000 so there is some evidence that we’re doing okay. Email “O'Neill drops strong hint that he'll stay on until Euro 2020 after discussions with John Delaney”. Feedback on “O'Neill drops strong hint that he'll stay on until Euro 2020 after discussions with John Delaney”.